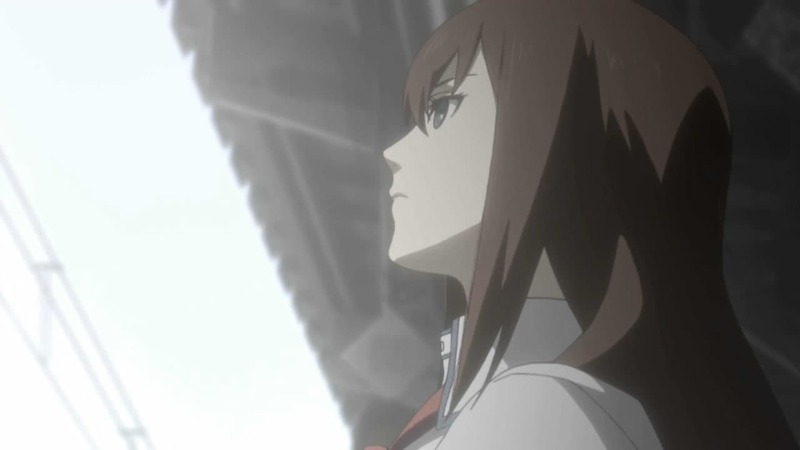 As Rintarō and Kurisu hide out from the rain, she explains how she recalls her stabbing from dreams, as well as Rintarō’s various attempts at saving Mayuri. When Kurisu tells Rintarō that he should save Mayuri over her, he can’t accept it and runs off. As Rintarō attempts to time leap again, Kurisu stops him, worried that seeing Mayuri die over and over will destroy him. After giving in and choosing to go save Mayuri, Rintarō tells Kurisu he loves her, to which she responds by kissing him. The next day, Kurisu leaves for Japan, whilst Rintarō and the others delete their data from the SERN network. Just then, Kurisu returns to tell Rintarō she loves him, just before the data deletion takes him to the Beta World Line. After getting rid of the Mobile Microwave, Rintarō receives a call from Suzuha, telling him about World War III.